6 holiday trains you -- and your kids -- won't want to miss! Miniature railroads are so much fun. All the tiny people, buildings and chugging trains in these Lilliputian worlds are fascinating to find and point out. But many train exhibits also offer a history lesson of eras long past. Some of our favorite railroad exhibits are set in specific time periods, which allow kids to look back at our city and picture the past in completely new ways. The historic Cement City neighborhood joins the Carnegie Science Center Railroad & Village this year. One of the seven houses remains under construction. 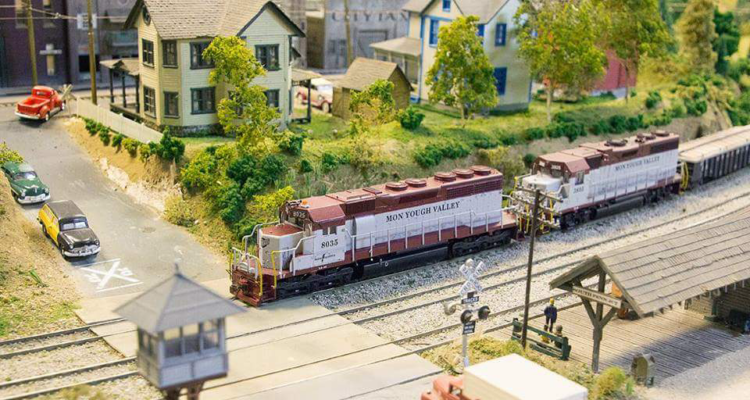 The Carnegie Science Center Miniature Railroad & Village focuses on the period between 1880 and the 1930s. Despite its old-timey era, the artisans who create new features every year are now using the latest technology in their work. A 3-D printer is being employed to make various components, although the finishing details are still done by hand. This year’s addition to the railroad display is Cement City in Donora. Thomas Edison’s 1916 experiment was intended to build inexpensive homes from poured concrete that could be completed within a week. These houses for factory workers proved to be more costly than anticipated, so Edison only built 80 of the planned 120 houses. The exhibit’s Cement City includes six concrete houses designed from original blueprints, along with one under construction. The tableau shows a block party of neighbors, the spirit of which remains in those who now live in the 100-plus-year-old homes. This new feature is a fine example of why the exhibit attracts more than 400,000 annual visitors, who look closely at all the tiny bits that make up the 83-foot-by-30-foot platform. Kids are at just the right height to get the best eye-level view of the O-scale Lionel trains. See if you can spot all 115 animations, which include kids on swings, a mother walking a fussy baby, and a homebody relaxing in a front porch rocking chair. More obvious movements include spinning rides in Luna Park and a steamboat operating via magnets through the 3-inch deep river. Look for familiar businesses that have survived over the years, like Primanti Brothers and Klavon’s Ice Cream Parlor. Examine the 23,000 fans at Forbes Field and all those heads made of Q-tips. Be sure to check out the motorcycle cop hiding behind a billboard, just waiting to catch a speeding car! Every time we stop by, we find something we’re overlooked before – like Punxsutawney Phil up on Gobbler’s Knob – so we love that the exhibit is open year-round, allowing for multiple visits. The original glass house is recreated as part of Phipps’ “Memories in Motion” in this season’s Garden Railroad. Photo by Rob Larson. 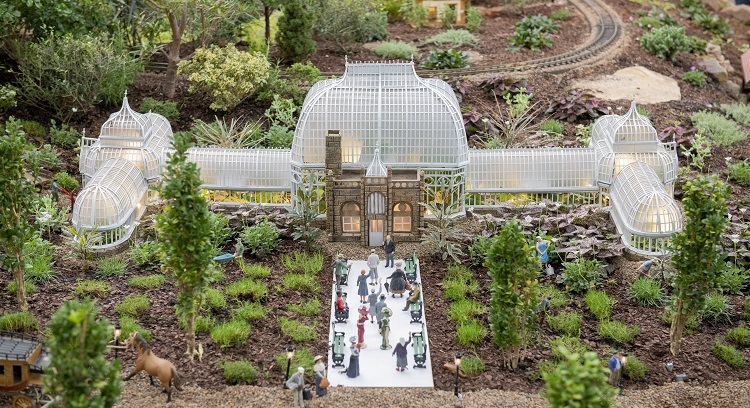 As part of Phipps Conservatory’s 125th anniversary, the redesigned Garden Railroad’s “Memories in Motion” sets scenes from 1893 to 2018 as the history of the conservatory unfolds over the years. A model train carries exotic plants from the 1893 Columbian World Fair to Pittsburgh to start the collection. Spot philanthropist Henry Phipps, whose gift to the city resulted in the original $100,000 Victorian glass house. Unlike other model railroads, the tiny trees and shrubs are live plants, adding a different aspect to the miniature landscape. 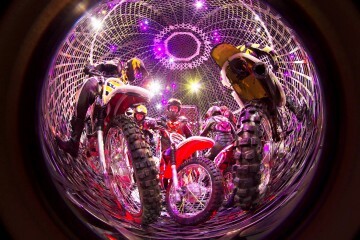 Several animatronics features allow kids to push a button to put things in motion, adding to the fun history lessons. Activate antique race cars speeding through Schenley Park or turn on the lights and music of a merry-go-round and concert band shell that once were part of the property. Watch boats cruise through Panther Hollow Lake and under the Panther Hollow Bridge. Time your stop with visits with Santa on select dates between Nov. 23 and Dec. 23. 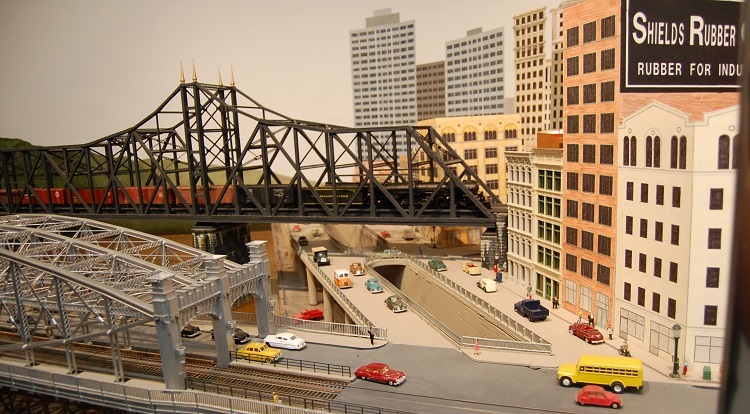 Look for familiar buildings and roadways at the Western Pennsylvania Model Railroad Museum. Note the Smithfield Street Bridge in the forefront. Founded in 1938, Western Pennsylvania Model Railroad Museum in Gibsonia is one of the oldest miniature railroad clubs in the country. The 4,000-square-foot layout fixes on the 1950s, a booming time for regional railroads that transported products to and from steel mills. The era was a changeover period between steam and diesel engines, which allows the club to run both types of locomotives. 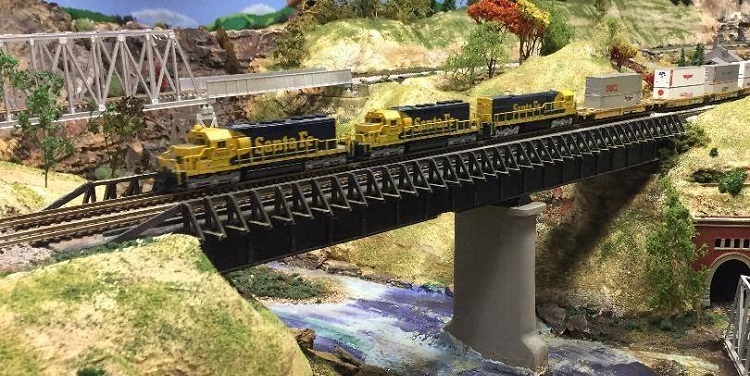 Local landmarks are depicted within the HO-scale display’s more than 6,500 feet of track, 300 locomotives and over 2,000 cars. Look for the P&LE train station (now Station Square), the J&L Steel Mill and Fallingwater. Club members add more details of street scenes and built-from-scratch buildings every year. A handout offers a fun scavenger hunt for kids to search from a list of items, like a garage under construction, servicemen waiting for a train and a woman on a bicycle. Little engineers will love the interactive displays with wooden trains and pushing the switch that sends Thomas the Tank racing on an HO track. The Toy Train display is fun, too, where two levels include an alien crash site, a dinosaur zone, and a drive-in theater. On Friday nights, the exhibit rolls back to 1949 to visit the “Twilight of Steam,” when all the steam locomotives run. The museum’s season runs through Jan. 13, followed by classes for those caught up in model railroading excitement. Club members at Ohio Valley Lines donate three model train starter set at every open house date. Philanthropy is part of the mission of Ohio Valley Lines in Ambridge. The club train enthusiasts extend their excitement for model railroads with a Trains for Tots program, which promotes the hobby in the next generation. Members collect and repair trains for donation. Each starter set includes a transformer, terminal track, engine, caboose, and four cars. Three sets are given away at random every day during the holiday display open house. Train donations also are made to organizations like The Salvation Army, the Moose Club “Heart to Heart Club,” and the Marines Toys for Tots program. 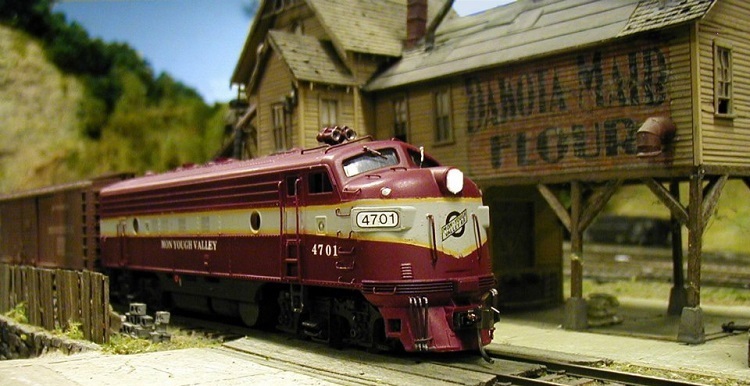 Ohio Valley Lines is a combination model railroad display, museum, and library. The train layout includes an HO-scale and N-scale track and trains available to view on weekends from Nov. 24 to Jan. 6. The McKeesport Model Railroad Club has been attracting train enthusiasts for 68 years. The 68-year-old McKeesport Model Railroad Club holds an annual open house for model train enthusiasts to view its 2,200-square-foot train display throughout the holidays. This year, the open house runs Fridays through Sundays from Dec. 7-30. The club’s fictitious Mon Yough Valley Railroad is set in the era between 1950 and 1960. The settings of HO-scale trains, people and buildings range from city scenes to mountain bridges and rural life. Look for a man shining shoes, kids playing at a picnic and a Clark Bar billboard among the tiny features. The remains of a snowstorm add to the charm of this railroad village at Pennsylvania Trolley Museum. The Lionel train exhibit at the Pennsylvania Trolley Museum is more of a fanciful village dressed for the holidays than any particular era. The Victorian buildings could double for the town of Bedford in “It’s a Wonderful Life” – except for the golden arches of a McDonald’s! Kids can combine the train exhibit with a ride on the Santa Trolley and a visit with the big guy himself. The restored and decorated streetcar travels along a 2-mile track. Other activities during “Trolleys and Toy Trains” include making a holiday craft, free hot chocolate and cookies, plus a look at the fanciful LEGO layout built by Steel City Lug members. And the collection of nearly 50 trolley cars is worth browsing through.